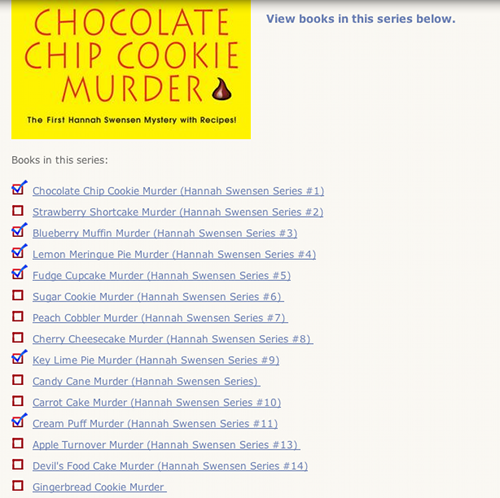 Cozy Mysteries Unlimited has a NEW feature! Keep track of the books you've read in a series! I know that I find myself on a Series page wondering which books I've read-- especially when it's an older cozy mystery series that I haven't read in a while. I'm continually looking up on my library list or on my bookshelves to see if I've read a book before I purchase it. We now have a new feature on each of the Series pages that lets you simply click on the checkbox . Once you do a check mark appears to indicate that you've read that book. You can easily undo it by clicking on it again! You must be logged in to use this feature. Registration is free! Login or Register for FREE now! After you log in navigate to the Series page you are interested in and you will see check boxes next to each title. To start taking advantage of this new feature use the left-hand-side navigation to go through the categories to view each series and check off the books you've read. When you are logged in you will see a link in the left-hand-side navigation area to 'View Books You've Read'. This displays all of the books, organized by series that you've marked as read! It's a nice quick reference! NOTE: You have to go to each Series page and mark books as read before anything will appear on your list! Below is an example of what the series page will look like when you're logged in! As always we would appreciate it if you click on our books to view or purchase them at Amazon!